The project is strategically located and the building is cautiously designed by Fengshui rules. D’Qube Square is located at batu 7.5, there are over 300,000 population in five kilometers range. In addition, a new road will be constructed to connect Samarahan to Kuching International Airport. Bustling Kuching city is located at the north and the Serian district is at the south, which closes to the border with Indonesia. D’Qube Square is located next to the main road, which connected Kuching and Indonesia. It is the time for Y generation. Thus, the integrated development is the model of the future. D’Qube Square integrated both commercial and residential which create absolute convenience for the residents. D’Qube Square engaged the feng shui elements, wisdom which last over 5000 years, to design the residential and commercial layouts. It is not only enhances the magnetic energy but also creates a stable environment. 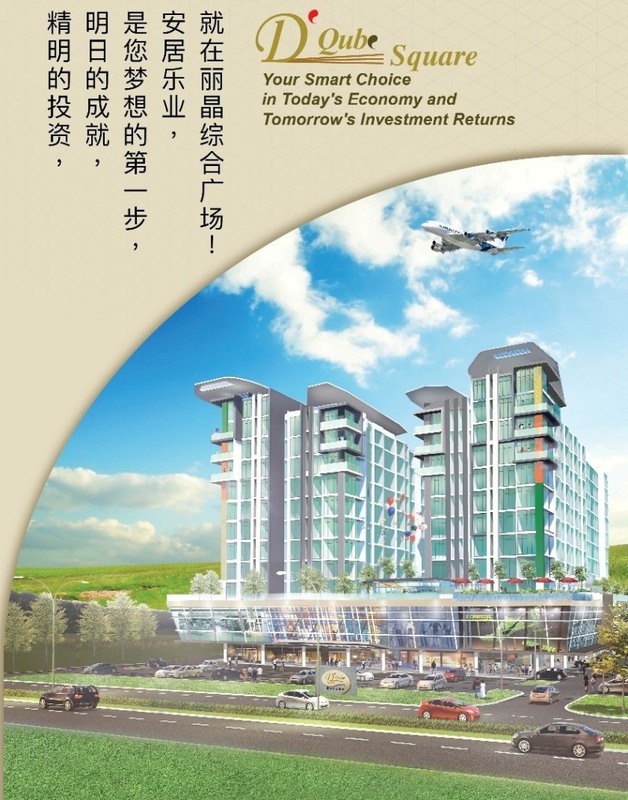 The goal is to provide residents and investors a high quality development with harmony, enthusiasm, and bright future. D’Qube Square’s ingenuity and comprehensive design to meet the diverse needs which including two rooms, dual-key three rooms, three rooms, sky terrace house(with private garden), five rooms duplex (located at top floor), as well as ground floor young generation business hub. Business hub is the platform for the young entrepreneurs where they can realize their dreams. It will attract the crowds and become the focus brand of D’Qube Square. It is the pride of Sarawak! Malaysia government focuses in developing the state of Sarawak. There are various significant projects including Sarawak renewable energy corridor and Pan-Borneo highway. It will lead to the return of Malaysian talents from overseas and migration of foreign professionals. Therefore D’Qube Square’s concept is planned to meet the needs and expectation of Y generation youth, talents (after 505 election), foreign immigrants, and retirees (mainly from Japan, Singapore, South Korea, Taiwan). The developer is customer oriented and sells at the reasonable price. Hence it is the best time for purchasers to invest in D’Qube Square. With its innovation and creativity, the value of this property has the great potential of increment thus you can purchase it with the peace of mind! The pioneering development of D’Qube Square will attract not only pilots, cabin crews, and ground staffs but also medical staffs, students and foreign businessmen. There are major landmarks and facilities surrounded D’Qube Square. So, this project has significant appreciation forecast. High quality development with reasonable price enables the young generation to own a dream house. This is the best starting point to build a warm and joyful family. The down payment is affordable and the monthly loan payment is manageable. Therefore you will not have additional pressure and concern. This allows you to fully focus in building your future dream.